How do I get my car licence? Home › Driver licence › How do I get my car licence? There are three stages of a car licence: learner (class 1L), restricted (class 1R) and full (class 1F). This is called a graduated driver licence system and at each extra stage you get extra responsibilities. How much does a car licence cost? The total cost depends on how many times you have to take the test, whether you use a driving instructor and whether you choose to take a defensive driving course. Click here to use our car licence calculator. Before you’re allowed to drive on the road you must have a learner licence. How do I get a car learner licence? Ensure that you know the road rules. You can practice the questions you need to ask by taking our free mock theory tests. The minimum age is 16 before you can take the test, but you can practice earlier than that. Apply by filling in this application form. Provide a valid identification document. Pay the application and test fees. What is the learner licence test like? It’s a computerised test similar to what you can practice here. You will have 30 minutes to complete 35 questions, and you must get at least 32 correct. What happens when I pass the car learner licence test? You will be given a temporary licence at the testing centre. This means you can now drive a light vehicle (most cars, vans and utes, and some small trucks) with a supervisor. Your real learner licence will arrive two or three weeks later and is valid for five years. 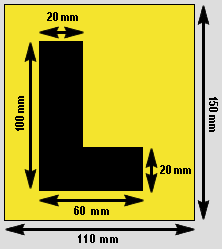 You must put L plates on any vehicle you use to practice driving in, including a moped or ATV. You can find these at service stations, auto parts stores, supermarkets and vehicle testing centres. You should be looking to find a driving instructor to help you get through your restricted licence test. What can I do on a car learner licence? You can drive on the road with a supervisor sitting next to you in the front passenger seat. A supervisor is a person who has held a full New Zealand car licence for at least two years. You can tow a trailer up to a gross combination mass of 4500kg. You can drive a moped (but not a motorbike) on your car learner licence, but not between 10pm and 5am, and you cannot carry a pillion passenger. You can drive a motorhome or tradesperson’s vehicle with an on-road weight of less than 4500kg. You must have your learner licence with you at all times when driving. There is no restriction on the number of different cars you can practice in, and they can have a manual or automatic gearbox. What can’t I do on a car learner licence? You can’t drive without a supervisor in the vehicle. You cannot drink any alcohol and drive if you are under 20 years old. See the alcohol limits for driving. What if I don’t pass the learner licence test? You can apply to take the test again and pay the test fee to retake it. You don’t have to pay the application fee again. If you require an eyesight certificate, it must still be valid otherwise you will need to get another one. Depending on the waiting times, you may be able to get another test within a few days, but it could be a couple of weeks. If you don’t show up for your test you must pay again for another one. How do I get a restricted car licence? You must have had your learner licence for at least 6 months then pass a restrict licence practical test, i.e. the minimum age is 16 years and 6 months. Book a test using this online service from NZTA. Once you have a test date and time you will need to make your application at a driver licensing agent. You can find a list here. Provide a medical certificate, if required. Making the application will take at least 30 minutes, so allow at least an hour before your test time to ensure you don’t miss your test slot. What can I do on a restricted car licence? You can drive on your own between 5am and 10pm. You can drive a car with an automatic gearbox if you passed your restricted licence test in an automatic car, or a manual or automatic gearbox if you passed your restricted licence test in a manual car. If you are driving on your own you can drive a car with an automatic gearbox if you passed your restricted licence test in an automatic car, or a manual or automatic gearbox if you passed your restricted licence test in a manual car. If you are driving with a supervisor you can drive either an automatic or manual car. You can drive an agricultural tractor with a gross laden weight of less than 18,000kg at 40km/h or less, or an agricultural tractor towing an agricultural trailer with a gross combination weight of 25,000kg or less at 40km/h or less. What can’t I do on a restricted car licence? You can’t drive between 10pm and 5am on your own, but you can if you have a supervisor sitting in the passenger seat next to you. You are not permitted to drive with passengers unless you have a supervisor in the car, unless those passengers are your spouse/partner, dependent child, parent or guardian, relatives that live with you and are on a benefit, or someone for whom you are their primary caregiver. What if I don’t pass the restricted licence test? If you miss it or fail the test, you’ll need to pay the test fee again. Remember a test can be failed if your car is not up to WoF standard, is not registered, doesn’t have current RUC, will run out of fuel, or doesn’t have L plates; or you turned up to the test without a supervisor or you forget your licence. Drivers 25 years old and over: Complete an advanced driving course such as Street Talk and the minimum time is reduced from 6 to 3 months. What can I do on a car full licence? You can now drive any type of light vehicle (i.e. one weighing less than 3500kg) on your own without any time restrictions and you can tow a trailer making a gross combination weight of 6000kg or less. You can also drive a number of other large agricultural vehicles and tractors. What if I don’t pass the full licence test? You will need to rebook the test and pay the test fee. You can still drive on your restricted licence as long as it hasn’t expired. How long is the practical test? The restricted licence test is 60 minutes. There is 45 minutes of driving time and 15 minutes checking the safety of the vehicle and to provide feedback. The full licence test is 30 minutes including 20 minutes of driving. Are there any restrictions for driving hybrid or electric vehicles? You do not need a special driver licence to drive hybrid or electric vehicles. They are treated as light vehicles and will either be automatic or manual.